and spatial object types that are relevant to the dataset(s) they administer. This application is foreseen to be useful especially in situations when datasets fall under two or more INSPIRE data themes / application schemas content. The application also serves as a catalogue of all objects defined by INSPIRE. a catalogue of all spatial objects and their properties defined by INSPIRE in the alphabetic order. The user still can select one or more objects and continue with e.g. comparison with the data he/she administer. a step-wise Interactive Workflow. The interactive workflow starts with an intuitive selection of INSPIRE data theme(s) that is followed by selection of relevant application schema(s), if relevant. a direct search in all categories of INSPIRE objects. The method allows you to search for an object(s) using a text string placed by a user. The search engine looks in the labels, definitions and descriptions of existing INSPIRE objects, application schemas and data themes. The main outcome of this application is the list of the INSPIRE objects, including their properties – attributes, code lists values etc. which are relevant to one’s dataset(s). The final list also includes all associated objects and their properties. Find a spatial object type and its property defined by INSPIRE. Identify data properties needed to be transformed according to INSPIRE definitions. Identify a potential INSPIRE data theme extension, to cover his/her full dataset scope. The application schemas included in this section are specified in UML, version 2.1. The use of a common conceptual schema language for formal documentation of the data models allows automated processing of application schemas. The spatial object types, their properties and associated types are shown in UML class diagrams. 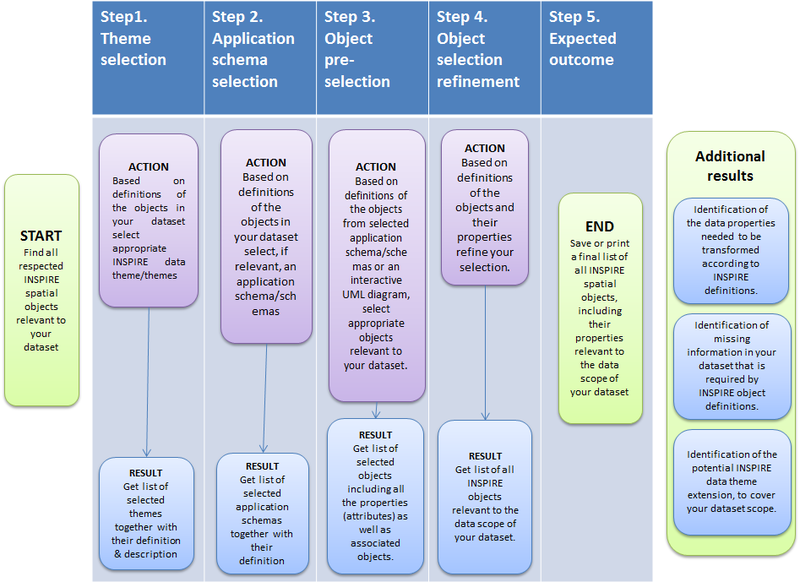 The interactive workflow (diagram) starts with an intuitive selection of INSPIRE data theme(s) that is followed by selection of relevant application schema(s), if relevant. Both selections are made based on the definition of themes and application schemas. The following step is about concrete spatial objects selection based on their definitions and if needed based on the interactive UML diagram. Then the workflow continues showing a preliminary list of all selected objects including their properties (attributes) as well as all associated objects. This list could be refined by going back and change the selections made based on the additional resources, definitions, detailed comparisons etc. Once the final list of objects is complete than the user has two options to save and print the final result. The PDF/DOCX shows all selected INSPIRE Objects and their properties + list of associated objects including their properties. The 5 described logical steps of the interactive workflow are also summarized in the diagram. The Direct Search method allows you to search for an object(s) using a text string placed by a user. The search engine looks in the labels, definitions and descriptions of existing INSPIRE objects, application schemas and data themes. The most relevant objects from the list can be added to a collection of “favorite” objects. This step can be repeated, thus more objects can be added to the “favorite” list. The workflow continues showing a preliminary list of all selected objects including their properties (attributes) as well as all associated objects. This list could be refined by going back and change the selections made based on the additional resources, definitions, detailed comparisons etc. Once the final list of objects is complete than the user has two options to save and print the final result. The Catalogue of objects allows you to search for an object(s) that are ordered according to the alphabet. The catalogue can also be filtered by showing only spatial object types, data types or code lists / enumerations. Once an object or objects are found they can be also selected (add to favorites) and could then serve for e.g. comparison with the content of data providers databases utilising gone of the several output options (PDF/DOCX, Matching table). All object types keep and also show all the mandatory associated links to other INSPIRE defined object types.